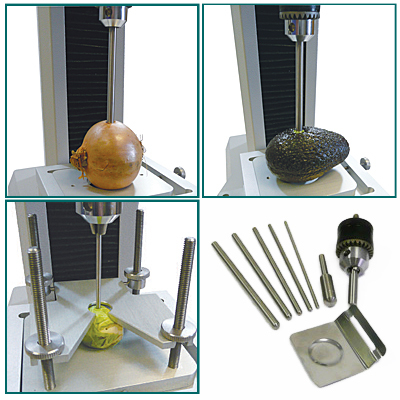 Food Technology Corporation’s TMS Magness-Taylor probe set is widely used in the texture assessment of fruits and vegetables - measuring the resistance to penetration, which is a key indicator of ripeness. The test fixture provides food technologists with a wide range of penetration testing options beyond the boundaries of traditional Magness-Taylor penetrometry measurements. This diversity of applications has made it popular in many industries beyond fresh produce testing, such as confectionery and dairy products. 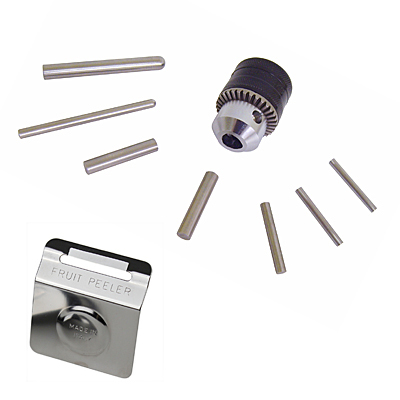 The test set consists of a 9.5mm (3/8") capacity chuck, which is fitted directly to the load cells and enables technologists to use almost any geometry of test cylinder for penetrating their samples. FTC supply 5 x 120mm long stainless steel probes with 3, 4, 5, 6, and 7mm diameters as standard. Each of these probes has both flat and rounded ends providing 10 versatile test options. The set also includes 5/16" and 7/16" Magness-Taylor probes and fruit peeler used as industrial standards in assessing fruit ripeness and firmness (crispness). 3/8" (9.5mm max capacity) Chuck with 3mm; 4mm; 5mm; 6mm; 7mm diameter stainless steel probes with 1 flat and 1 radius end. Also includes 5/16" and 3/16" traditional Magness Taylor probes for fruit penetrometry.